Nick Purves and Ian Lance, RWC – New Challenges for Value Investors – Is this time different? As part of their presentation, each of the speakers will give at least one current investment idea. Winton Capital has also kindly agreed to sponsor a drinks reception after the event, which will be a great opportunity for networking amongst the value investing community. With 9 weeks to go, the number of delegates attending is already well ahead of the total who came last year. It is expected that the 2013 conference will be the largest gathering of value investors ever outside of the USA. The last London Value Investor Conference donated its profits to the children’s charity, the SMA Trust. This year’s conference will be supporting the children’s charity Place2be. In How to Beat The Little Book That Beats The Market: Redux (and Part 2) I showed how in Quantitative Value we tested Joel Greenblatt’s Magic Formula outlined in The Little Book That (Still) Beats the Market). Like the Magic Formula, it seeks to identify the best combination of high quality and low price. The difference is that Quality and Price substitutes different measures for the quality and price factors. There are reasonable arguments for adopting the measures used in Quality and Price over those used in the Magic Formula, but it’s not an unambiguously more logical approach than the Magic Formula. Whether one combination of measures is better than any other ultimately depends here on their relative performance. So how does Quality and Price stack up against the Magic Formula? Here are the results of our study comparing the Magic Formula and Quality and Price strategies for the period from 1964 to 2011. Figure 2.5 from the book shows the cumulative performance of the Magic Formula and the Quality and Price strategies for the period 1964 to 2011. 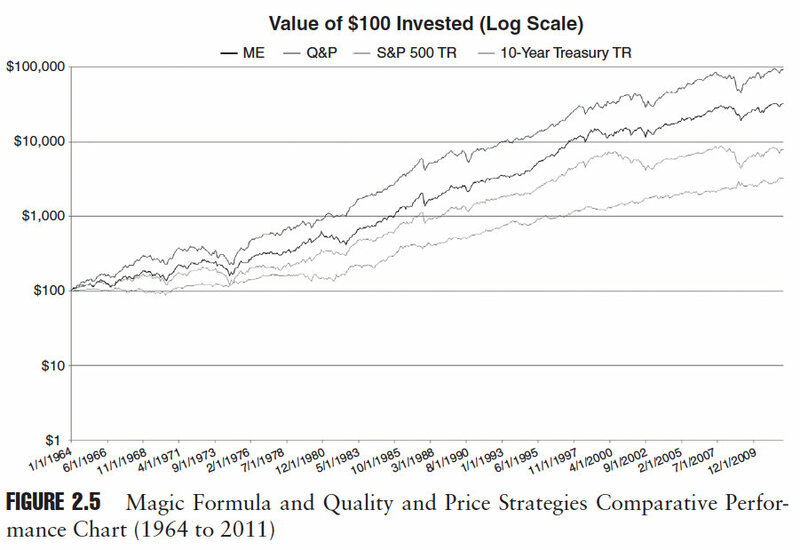 Quality and Price handily outpaces the Magic Formula, turning $100 invested on January 1, 1964, into $93,135 by December 31, 2011, which represents an average yearly compound rate of return of 15.31 percent. The Magic Formula turned $100 invested on January 1, 1964, into $32,313 by December 31, 2011, which represents a CAGR of 12.79 percent. 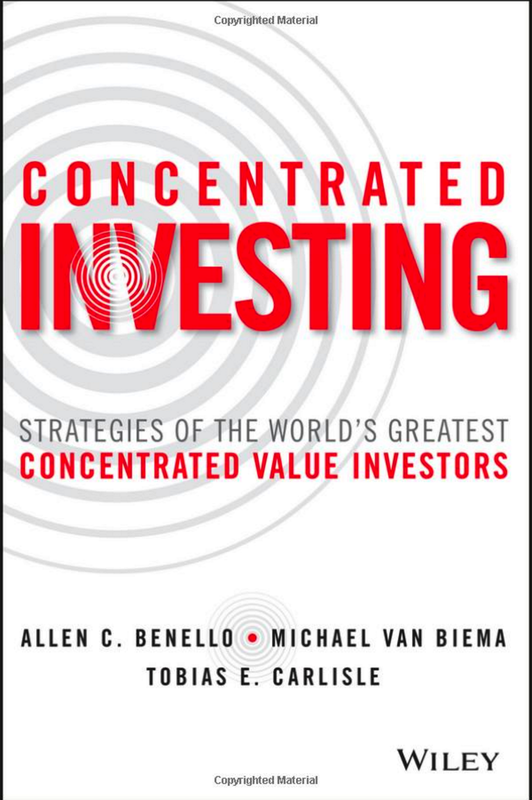 As we discuss in detail in the book, while much improved, Quality and Price is not a perfect strategy: the better returns are attended by higher volatility and worse drawdowns. Even so, on risk-adjusted basis, Quality and Price is the winner. Figure 2.7 shows the performance of each decile ranked according to the Magic Formula and Quality and Price for the period 1964 to 2011. Both strategies do a respectable job separating the better performed stocks from the poor performers. 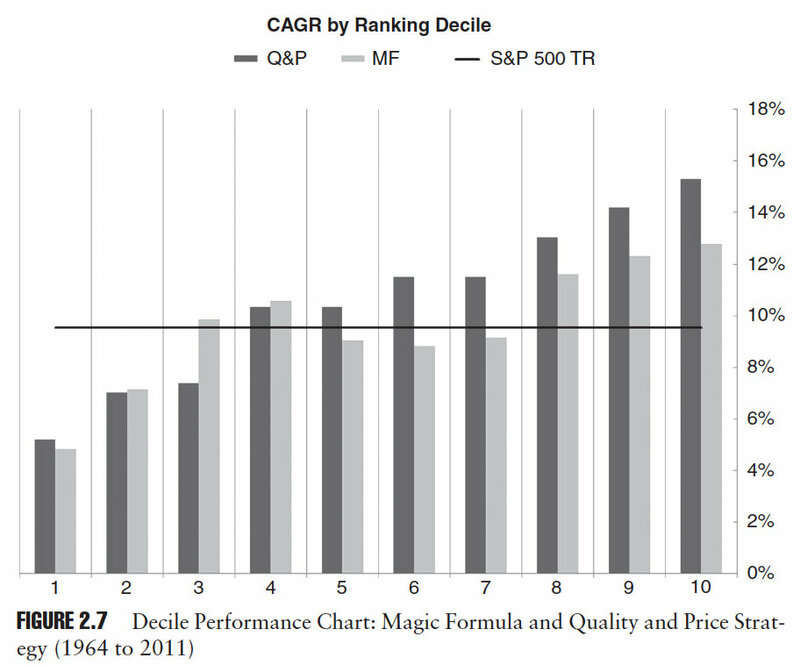 This brief examination of the Magic Formula and its generic academic brother Quality and Price, shows that analyzing stocks along price and quality contours can produce market-beating results. This is not to say that our Quality and Price strategy is the best strategy. Far from it. Even in Quality and Price, the techniques used to identify price and quality are crude. More sophisticated measures exist. At heart, we are value investors, and there are a multitude of metrics used by value investors to find low prices and high quality. We want to know whether there are other, more predictive price and quality metrics than those used by Magic Formula and Quality and Price. In Quantitative Value, we conduct an examination into existing industry and academic research into a variety of fundamental value investing methods, and simple quantitative value investment strategies. We then independently backtest each method, and strategy, and combine the best into a new quantitative value investment model. 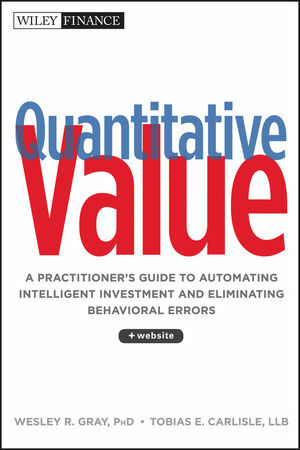 Order from Quantitative Value from Wiley Finance, Amazon, or Barnes and Noble. THE bookshelves in the conference room of Tweedy, Browne & Company are lined with financial history. Dry securities references, some of them filigreed and bound in cracked brown leather, date back to 1939. See Investing with Tweedy, Browne and Co. I had just completed what I thought was some fancy footwork involving buying and selling a long list of stocks. The oldest member of Morgan’s trust committee looked down the list and said, “Do you think you might be trying too hard?” A the time I thought, “Who ever heard of trying too hard?” Well, over the years I’ve changed my mind about that. Tonight I’m going to ask you to entertain some ideas shoe theme is this: We probably are trying too hard at what we do. More than that, no matter how hard we try, we may not be as important to the results as we’d like to think we are. …[M]ost of us spend a lot of out time doing something that human beings just don’t do very well. Predicting things. And when it comes to forecasting – as opposed to doing something – a lot of expertise is no better than a little expertise. And may be even worse. If there is a reliable and helpful principle at works in our markets, my choice would be the ones the statisticians call “regression to the mean”. The tendency toward average profitability is a fundamental, if not the fundamental principle of competitive markets. It can be a powerful investment tool. It can, almost by itself, select cheap portfolios and avoid expensive ones. Simple approaches. Albert Einstein said that “… most of the fundamental ideas of science are essentially simple and may, as a rule, be expressed in a language comprehensible to everyone“. Look at the best performing funds for the past ten years or more. Templeton, Twentieth Century Growth, Oppenheimer Special, and others. What did they have in common? It was that whatever their investment plans were, they had the discipline and good sense to carry them out consistently. Spend your time measuring value instead of generating information. Don’t forecast. Buy what’s cheap today. 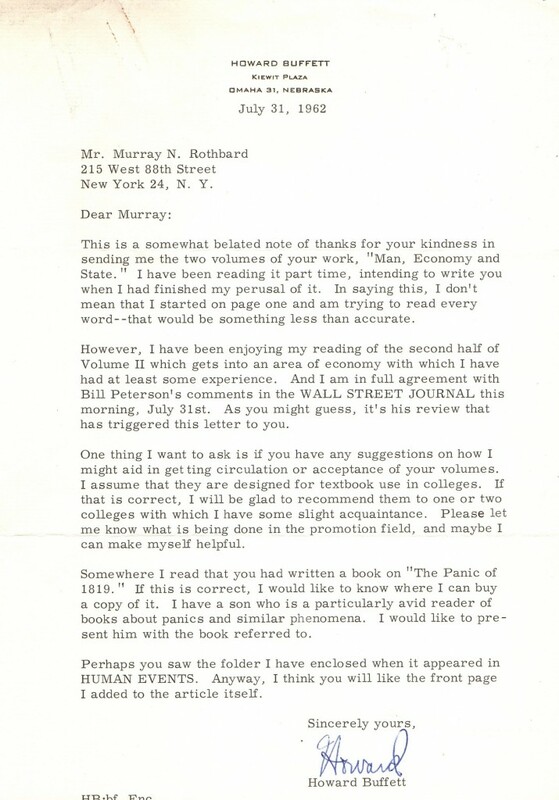 Read Trying Too Hard (.pdf). You won’t regret it. The signs, like the rumblings of an Alpine ice pack at the time of thaw, had been heard. The glacial heights of the stock boom suddenly began to melt in a thaw of sell-off. More and more stocks went up for sale, with fewer and fewer takers at the asking price. Then suddenly, around lunchtime on Monday, May 28, the sell-off swelled to an avalanche. In one frenzied day in brokerage houses and stock exchanges across the U.S., stock values — glamor and blue-chip alike — took their sharpest drop since 1929. Memory of the great crash, and the depression that followed, has haunted America’s subconscious. Now, after all these years, was that nightmare to happen again? The article continues that, “although the Dow Jones Industrial Average fell almost 6 percent on that one vertiginous Monday and the market was anemic for a year afterwards, the markets as a whole, at home and abroad, did bounce back.” Good to know.